I've been doing a little shopping at Forever 21 lately, which always makes me feel weird because technically I am 12 years too old to be shopping there. (Strike that, maybe 20 years too old given many of the customers I see there!) Thinking about Forever 21 and my shopping habits made me reflect a little about the different strategies stores use with customers in regards to the presentation of merchandise. What a gorgeous unique print and I love that bag. Thanks Imogen! I also really liked the print. I love modern, abstract prints. What a gorgeous dress Katie and I love the touches of mint/aqua and lemon yellow! Thank you Ada! I love the all of the retro mint, aqua and yellow colors that are so prevalent this year for spring. Thank you! The print is obviously what sold me on the dress. It's very unique especially for Forever 21. Love the bag! and really love the colors and style of your shift dress! Thank you! I've been getting a lot of wear out of this bag. It seems to go with everything for spring. I LOVE this dress. The print and colors are perfection! Thank you Riva! 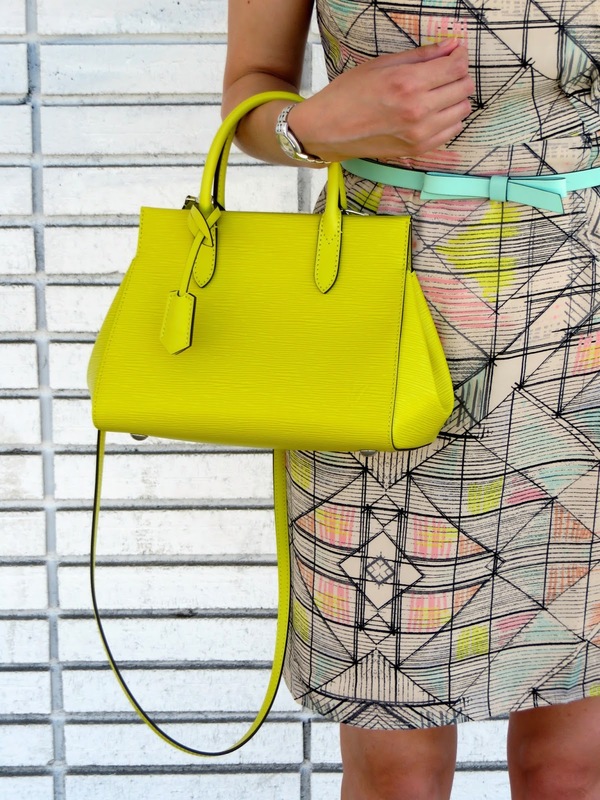 Yes, the print and colors are a perfect combo together. Thanks for stopping by! That dress is so cool! F21 has some great pieces if you can manage to look through the massive amounts of clothes there...haha. I LOVE the bright bag too! Yes, it just takes patience in order to successfully shop at Forever 21! Thanks for stopping by Jessica! You're killin' the spring looks! FAB! Aww... thanks Dawn! 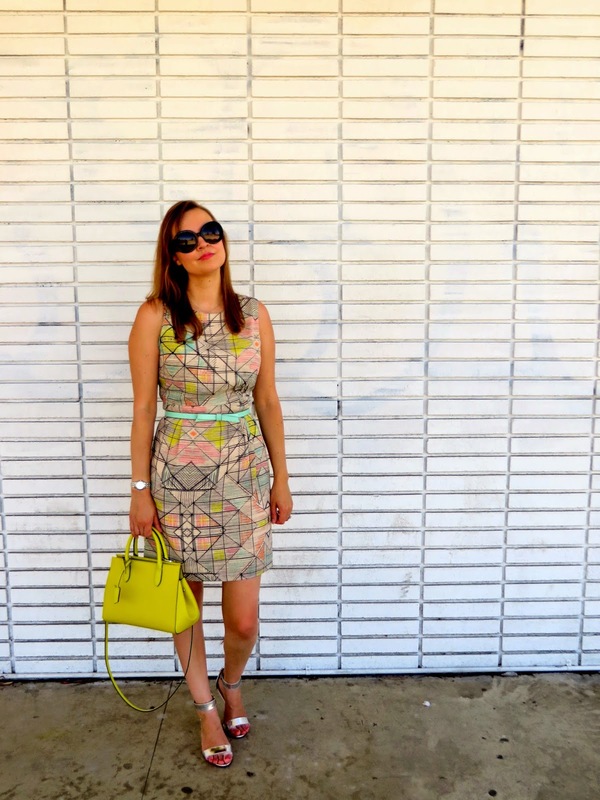 I love dressing for spring with all of the fun colors. What a beautiful dress! I also am in loveeeeee with your sunglasses! You are just too chic! Thank you Nicole! I get a ton of use out of these sunglasses. They are my favorite! A good hunt indeed! This dress looks much higher end than F21. I tend to shop mostly online with F21 since I am so overwhelmed with the endless amount of clothes they have in stores. Thank you for joining TBT Fashion link up and hope to see you next week. Have a great weekend! I definitely think if you can shop around at places like Forever 21 you can find pieces that look higher end for great prices. I guess that's part of the thrill of the hunt. Thanks for hosting the link up and have a great rest of your weekend!